We honor the six brave Sisters–Sisters Salome, Celestine, Marceline, Seraphine, Cyrille, and Anthony–who made the harrowing trek from Montreal to establish a school in Oakland and provide education for those in need. 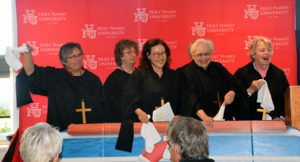 Holy Names University’s tradition of reenacting their arrival in the campus celebration of Founders’ Day has become much-beloved. Campus community, don’t miss this special anniversary event! Founders’ Day Mass in McClean Chapel: 5:00 p.m.
Alpha Delta Celebration in the Public Market: 5:30 p.m.